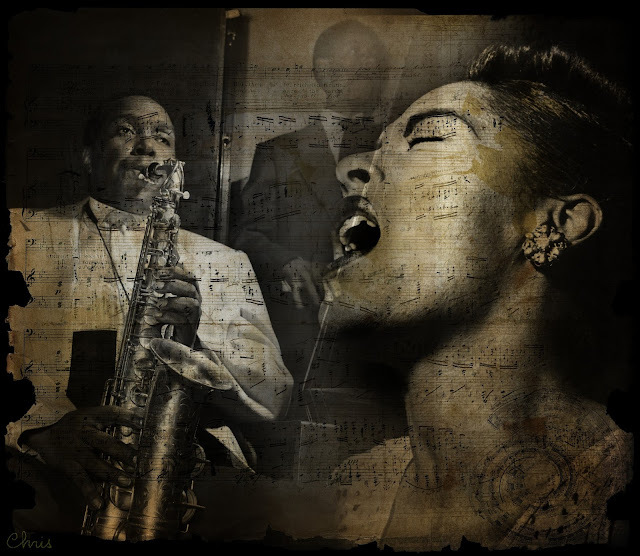 This week at Take a Word the theme is MUSIC, a nice excuse to pay a tribute to Charlie Parker and Billie Holiday, two geniuses of jazz music. It's nice to have fun with you ladies again! Hi Chris! I am always excited when I see your name in the challenge list and I am never disappointed. This is MAGNIFICENT - so elegant, so classy, so clever, SUPERB. Hello Christine! beautiful is it, your work! ...and nice to see you again. Been missing you! This is a bold piece representing two great artists. Beautiful work! Welcome back Chris I've missed your face...This is a stunning vintage, excellent layering, wonderful I love it. Fabulous work! My son who plays sax for a living would love this as a poster or art for the wall! I am such a huge Billie Holiday fan and this is just wonderful!